Currently Nifty is Trading Below its all Moving avg in daily chart. After a long time nifty trades below 200 Moving Avg. that's first sign of weakness in index.. but when nifty close below 7920 then Weakness is confirmed 100%. and we can test once again magic moving avg. 200 Weekly Moving avg. that's near 7400 +-30. 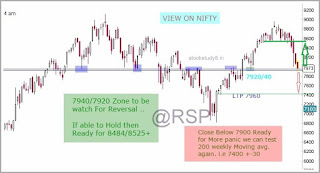 But i'm expecting before Closing below 7920 we can bounce till 8484. so watch the level 7940/20 spot. 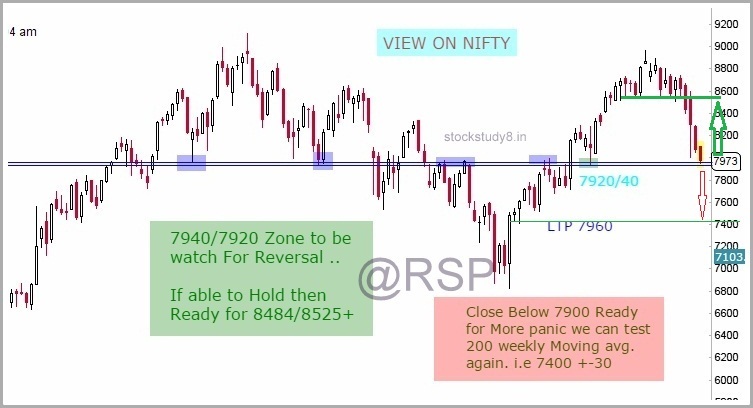 so conclusion is If able to Hold 7900 ready for 8484.. and close below that ready for more panic in market in coming days. Trade long or short in future with always Hedge with PE or CE. for Less Risk. View is purely educational purpose. trade with your risk.